Ars Eloquentiae, meaning 'the Art of Eloquence', is a young and lively ensemble, specialising in period instrument performance. It is so great to work with people of my generation. I know people in this group from a range of place such as: the Royal Northern College of Music and the Royal College of Music. There are also several players I know from attending Dartington Summer School and others I know from the Royal Academy of Music, Trinity College and then just general cross-over! It is so fantastic to see how well my contemporaries are doing, each weaving their own freelance careers. There is a fantastic atmosphere within this group. 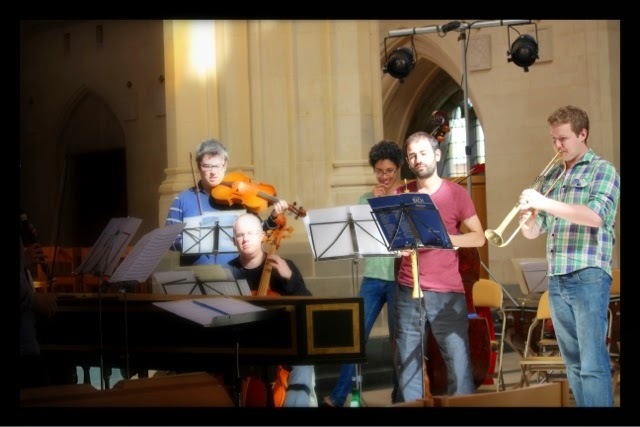 I have played with Ars Eloquentiae twice before, both times doing Bach's 2nd Brandenburg, firstly at the Church in Kew Green, where the group regularly performs in London and we also played for an education workshop at Bedford School. This time the programme featured Bach's Magnificat in D and the Brandenburg Concerto No.2 as well as the chorale and slide trumpet part from Jesu Joy of Man's Desiring. It was quite a challenging programme. The programme allowed a little time between playing the Magnificat and the Brandenburg, and playing the Magnificat within the security of a great section put me at ease for the rest of the concert. 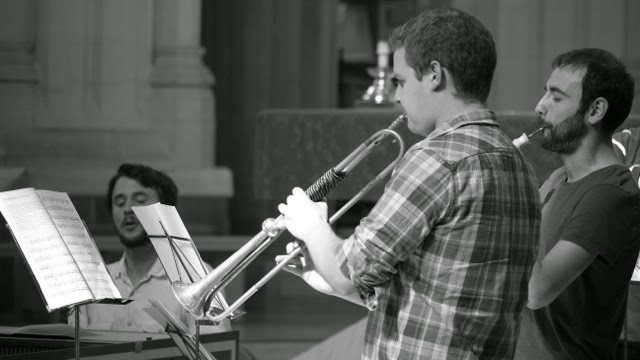 The concert featured three different trumpets, pictured below. At the top of the photograph is my Frank Tomes replica of the J. L. Ehe III 1746 natural trumpet. 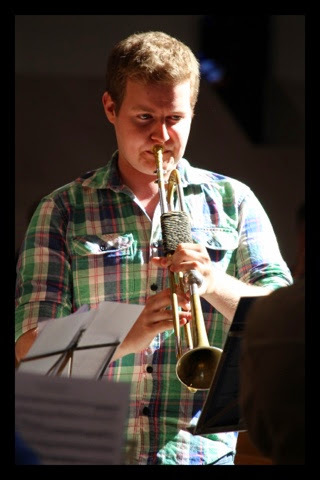 The middle trumpet is my F trumpet, which was made by both Frank Tomes and David Staff. Frank made the bell and Staffy made the tubing for it, as Frank was retiring and Staffy was taking over the workshop. This is made on the same mandrel as my D trumpet but the instrument is obviously shorter in length. The bottom trumpet is a zugtrompete (also known as a single slide trumpet, or a tromba da tirarsi). This trumpet was made on a different mandrel to the Ehe trumpets and it is a replica of a trumpet made by Huns Veit in 1651. You can see the slide lubricants are tucked inside the trumpet in the case, and the slide is slightly extended at the bottom left hand side of the photograph. The orchestra itself is a pleasure to play with, and there are lots of fresh ideas floating around. It's a very reactive group. The Brandenburg team featured: the oboe playing of Leo Duarte, violinist James Toll (also the concertmaster), László Roza on the recorder and I played the trumpet. I was also very fortunate to play the Magnificat with a brilliant 'trumpani' section of William Russell and Gareth Hoddinott (who can also be credited with taking some of the photos here), with Rosie Toll on Timpani. A fantastic section in both instances - and so easy to play with! As I am increasingly frequently seen with a camera in my hands, I was asked to photograph the group for their website publicity. I wanted it to look quite arty with a bokeh effect for the further away players, though in hindsight, perhaps this wasn't the best decision! Still, I think this image could be used artfully, perhaps interweaving text or a logo into the image in the space in the bottom left of the image. If I had the chance to do it again, I would reorder the people slightly and choose a broader angle so that it is not such a line of players, still it is a good record of the players on the day.